I’ve been tracking and studying the IBD 50 and IBD 100 going back to 2007. Today’s wholesale swap out of stocks is the biggest I can remember witnessing. A full 40% of the names on the Wednesday’s list were replace. 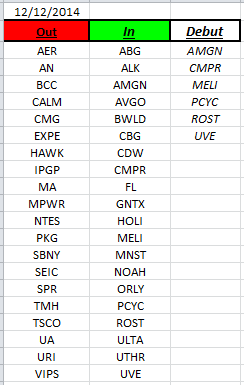 In addition 6 new stocks came on the list… I’ll talk to this a bit more after my weekend review………… This is very interesting–Just not sure why yet!